- Aleka Allen on 四月 12, 2016. 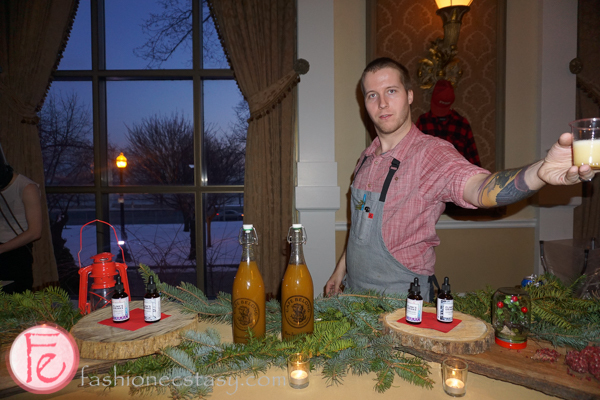 What an amazing night of cocktails, passion, and creativity! Monday, April 4th, 2016 was the Toronto regional final for Made with Love (MadewithLove), Canada’s largest annual mixology competition. Twenty of Toronto’s best bartenders competed for a spot in the upcoming national finals, which will be held in Montreal in May 2016. 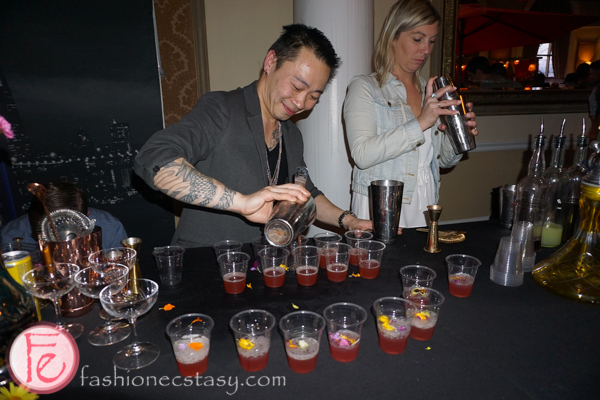 Hundreds of cocktail aficionados flooded the Liberty Grand Entertainment Complex on a chilly Monday evening. Each guest was given a dog tag necklace that they gave to their favourite competitor of the night as their vote for the ‘Public’s Choice’ winner. The Public’s Choice winner and the Judges’ Choice winner will advance to the nationals. While it was incredibly fun testing all twenty cocktails and accompanying food pairings, knowing that only two of those talented bartenders will go onto the next round was a little bittersweet. There were so many tasty cocktails – cocktails so exclusive that they wouldn’t be found anywhere else in the world – that it was hard to just choose just one. Nick Incretolli’s creation, the ‘What Would Jerry Do?’ cocktail was inspired by the book, How to Mix Drinks, a historic drink book written by Jerry Thomas, the pioneering American bartender. It was a tepache punch-based drink made with 1800 Tequila Reserve Silver, fermented pineapple cubes, a hibiscus salt and fizzy sugar rim, and topped with a black pepper spritz. It was an unusual blend of ingredients but the taste was a harmonious delight to the senses. The flavours of the drink came in layers: first, there were the tangy pineapple notes, then the floral notes from the hibiscus, followed by the fizzy sensation on the tongue from the sugar rim, and then the black pepper in the aroma. From Lake Road Restaurant, bartender Tyler Della-Nebbia created an Appleton’s rum-based drink called ‘The Tourist.’ The inspiration behind this drink was traveling overseas and bringing pieces of one’s home with them when visiting new countries. ‘The Tourist’ included a Mcintosh apple-rhubarb-and citric acid solution, maple falernum, allspice, and topped with carbonated coconut water. It was a very refreshing cocktail that blended Caribbean and Canadian flavours. The mini Jamaican jerk pork patty was the perfect pairing for this drink. Nick Incretolli – What Would Jerry Do? Parham Rahimi from Cluny Bistro with the cocktail, ‘Parisienne Pie,’ a Disaronno cocktail with brandy, juniper-infused rhubarb syrup, and grapefruit juice. The accompanying swordfish ceviche was to die for! Danielle Yoon from Annette Food Market with her Jack Daniel’s Tennessee Honey drink called, ‘My Mexican Honeymoon.’ It was a very soothing and sweet drink with lovely notes of nutmeg and cardamom. Matthew Rajchman from East Thirty-Six with his cocktail, ‘Café Anjou,’ a Wild Turkey bourbon-based drink with spiced pear puree, citrus juice, and topped with coffee air. André Aitchison from E11even with his drink, ‘The Nutty Caribbean,’ made with Disaronno, house made sorrel, ginger beer, coffee, and egg whites. No words can describe how good that concoction was! Since Danielle Yoon and Matteo Gorla won first place in their respective categories, they will be representing Toronto in the national Made with Love finals in May 2016. Congratulations to all of the bartenders who competed that night! The high level of creativity and showmanship of these talented professionals is what makes Made with Love such a highly anticipated event that all food and alcohol lovers should attend at least once in their lifetime!